Having always considered herself a creative person, Liz Manning found herself managing a design studio in Kew after completing a Diploma in Popular Music Performance. However, she began to suffer from insomnia and back pain and was constantly looking for successful treatments. As Liz began to research the best places to study, she quickly found herself impressed by London South Bank University's (LSBU) reputation and facilities. The university acupuncture clinic was a big plus for me, as was the fact that the course included modules on learning Chinese. It takes the time to educate students about Chinese culture and history, as well as medicine. 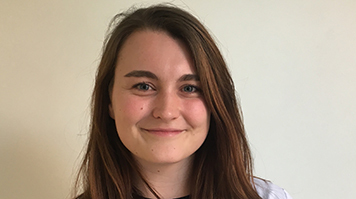 Since joining the course, those opportunities are something that Liz has made the most of, thanks in part to the Confucius Institute for Traditional Chinese Medicine at LSBU. One of 400 around the world, it is affiliated to the Chinese Ministry of Education and promotes Chinese culture within LSBU, the local community and a number of local schools. The Confucius Institute also includes a fully equipped acupuncture clinic which is used for clinical training, enabling students to observe and then practice in the clinic under the lecturer's supervision. Both of Liz’s parents are doctors, so she grew up with medical terms used in regular conversation. Along with the opportunities to travel and study the Chinese language, Liz credits the lecturing team at LSBU with being the best thing about the course. “My course leader, Ian Appleyard, is utterly inspirational and an amazing teacher,” she says. “Our clinical lead, Weidong Huang, is so thorough and makes sure that every patient is treated to the highest standard." I’m so lucky to study at LSBU and learn from such great teachers. Liz’s advice to others is simple. “Follow your passion and do what you love,” she says. It’s certainly an approach that has worked for her.